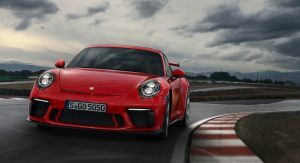 Official details about the 2018 Porsche 911 GT3 have just been announced at the Geneva Motor Show and as expected, the facelifted GT3 is precisely what the rumors suggested; faster, more powerful and available with a six-speed manual. 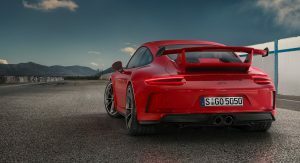 Beneath the updated body work, the 991.2 GT3 has been fitted with a new naturally-aspirated 4.0-liter flat-six engine that delivers 500 hp and 338 lb-ft of torque. 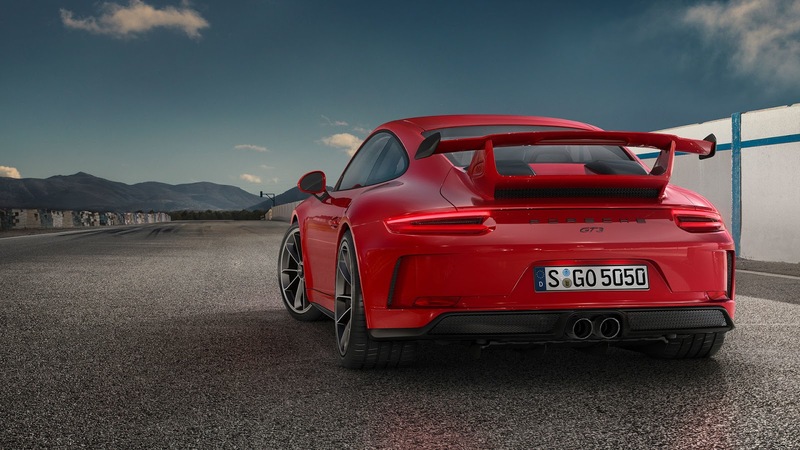 While the same size as the engine from the GT3 RS and 911 R, this unit is bespoke to the GT3 and actually based around the engines used in the 911 GT3 R and 911 RSR race cars. All up, the 2018 GT3 tips the scales at 3,153 pounds (1,430 kg) and when the engine is mated to the standard seven-speed dual-clutch PDK transmission, the car will accelerate from 0 to 60 mph (96 km/h) in a blistering 3.2 seconds before topping out at 197 mph (317 km/h). Perhaps the real headline of the new GT3 is the re-introduction of a six-speed manual to the car. If selected, it drops weight to 3,116 lbs (1,413 kg) and adds 0.1 seconds to the 0-60 mph sprint but lifts top speed to 198 mph (318 km/h). Elsewhere, the 2018 Porsche 911 GT3 receives a tuned chassis aimed at improving handling and driving dynamics. 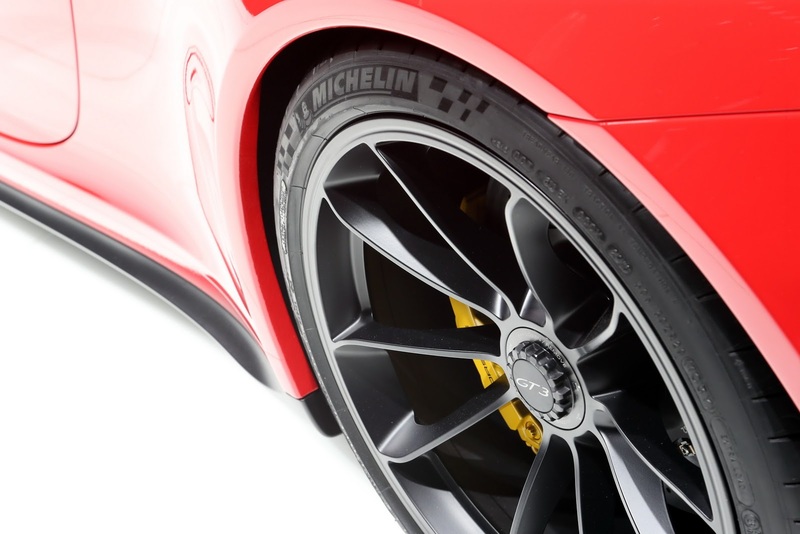 Rear Axle Steering has been added, a new lightweight carbon fiber rear wing installed and a modified front fascia fitted aimed at optimizing airflow. Additionally, a new diffuser and tailpipes are included. Other visual tweaks include new headlights and taillights. In the cabin, the updated car benefits from the same steering wheel as the 918 Spyder, modified sports seats with 18-way electric adjustment and the option of full bucket seats with fixed carbon fiber backrests. 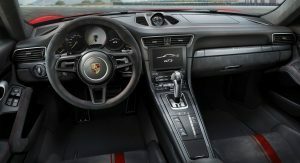 The Porsche Communication Management (PCM) also comes standard. 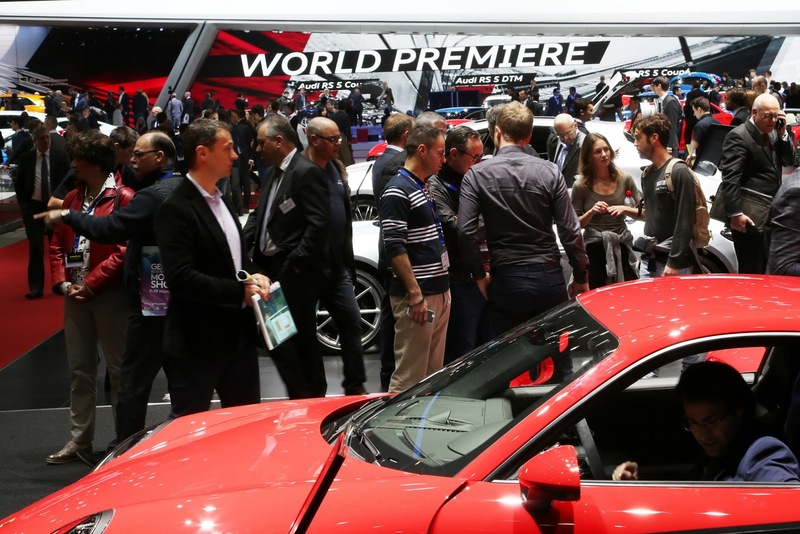 When the car lands in U.S. dealerships this fall, it will start at $143,600 excluding the $1,050 delivery, processing and handling fee. the previous looked better with the body details. I concur. More than the turbo-only lineup in the standard cars, I hate what the refresh did to the taillights, DRLs, fascia, engine cover, etc. I disagree. 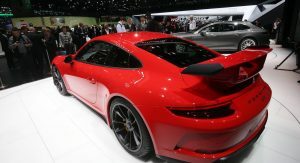 The 991.1’s styling looked almost like a kit car in the front. 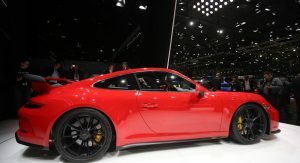 I prefer the sloped front of the 991.2 GT3. 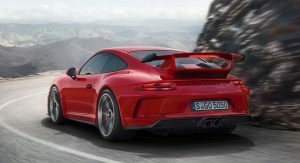 Porsche has finally made a car to make me consider trading into. 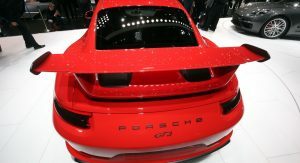 Although I was really hoping for the side vents to be added to the GT3. Would it make me lame if I added them to a GT3? Honest opinion please. People it’s $147k starting way cheaper than the 911r or 911GT3 RS and the way to get this one to future proof your resale is the 6 speed manual version. Hmm not quite sure how I feel about the front bumper. But other than that, it’s a very nice! Same, but I imagine it’ll be similar to the new Cayman. Looks boring in pictures, but really good in person. starting at $143k is really not bad. Strange, for two people that are supposed to be sworn internet enemies we sure have been agreeing on a lot of threads lately. What happened to the 7 speed manual? 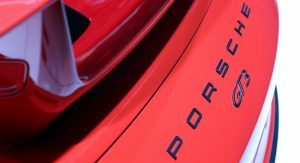 My god I love Porsche these days. Really looking forward to the RS now! 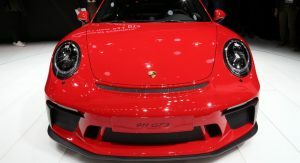 “Investors” who bought the 911R are having a really bad day. They knew that it was coming. 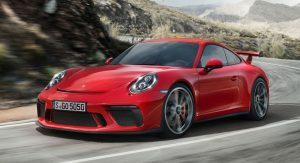 Wait until the 911 GT3 RS comes out in manual, those 911 R’s are going to tank in value really quick. 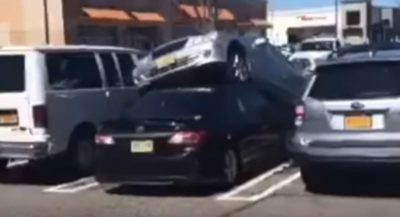 Nobody is going to pay $499,000 for that car. I’m getting tired of this argument. 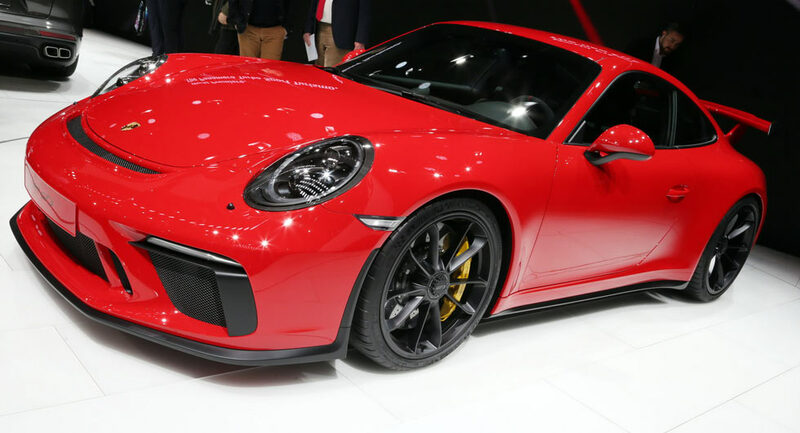 The 911R is still a limited run car. 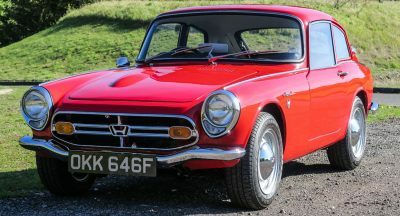 You can’t buy any more of that car. 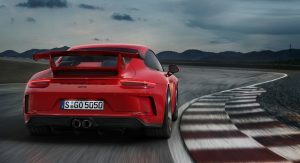 You can order a 991.2 GT3. 6MT does not everything make. Yeah it was, however, it was valued because of what it was and what was lacking on the market at the time. 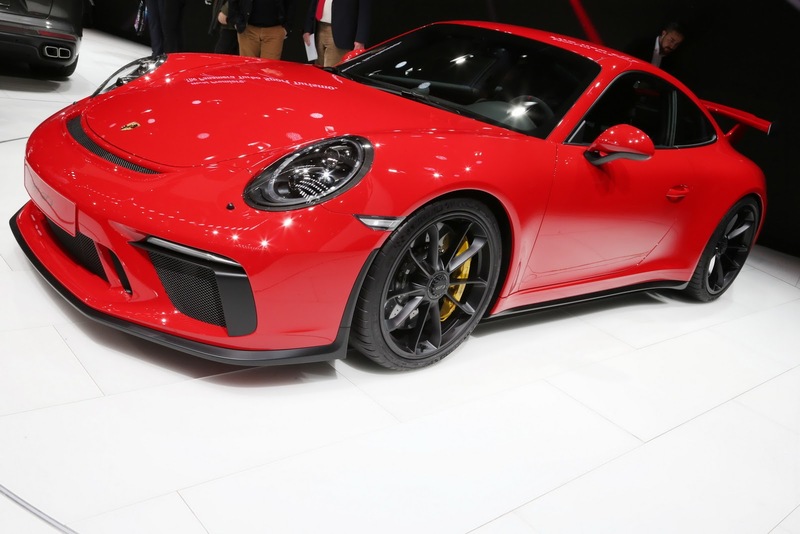 The 911 R had a naturally aspirated engine that generated hp 500 hp and a manual transmission. 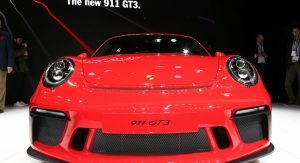 Now that the same combo it’s available in the GT3 for $143,600 who’s going to pay an additional $300,000 just to say that the car has a different name? And to make matters worse it’s the same generation. 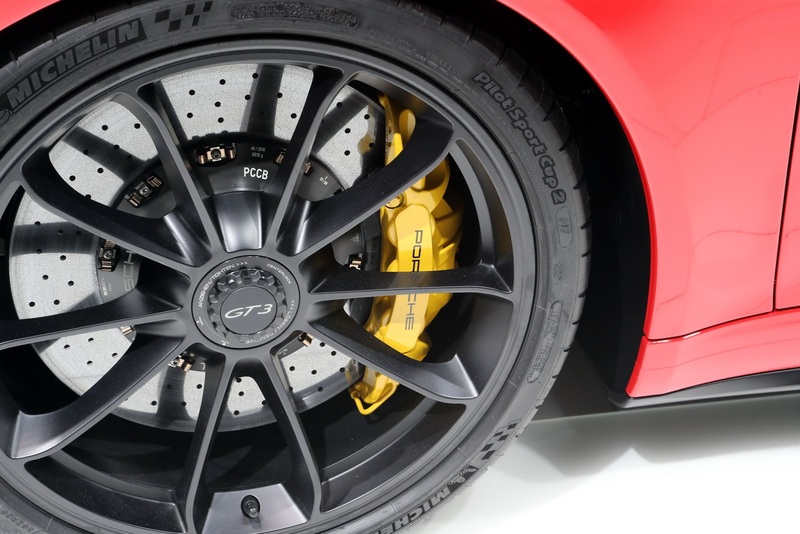 The 911 GT3 RS 4.0 had nothing like it in the 997 models. 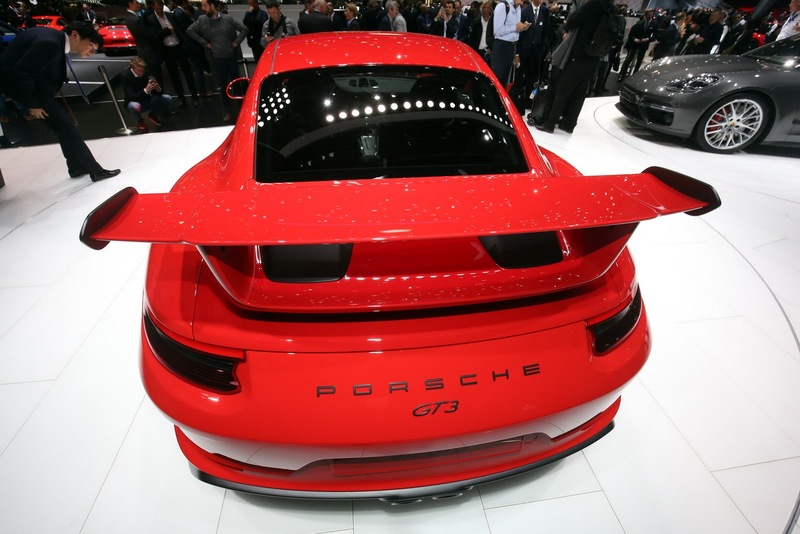 It will forever be remembered as THE 997 to have… period. Well that and the GT2 RS. 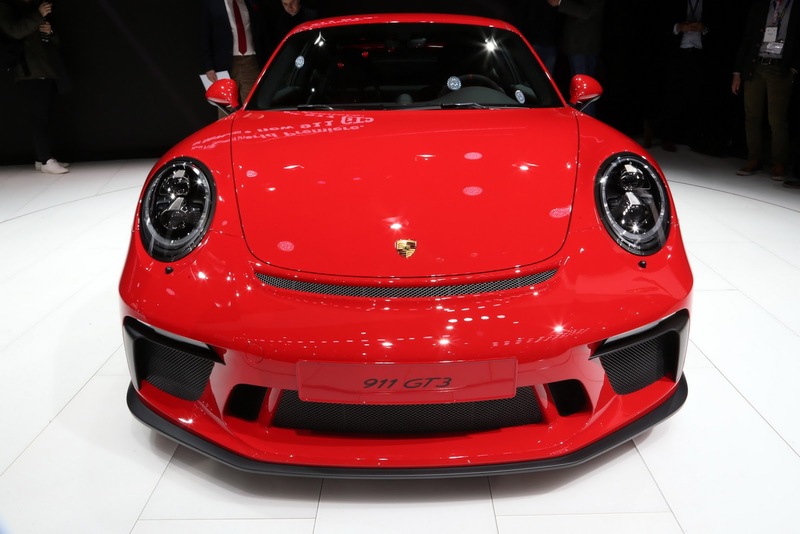 The 911 R will not be remembered as THE 911 to have because the 911 GT3 will beat it on a track because of the small improvements from 991.1 to 991.2 and it’s also lighter than the 911 R, plus the 911 GT3 RS is about to come out with like 530 hp (naturally aspirated) with a manual. 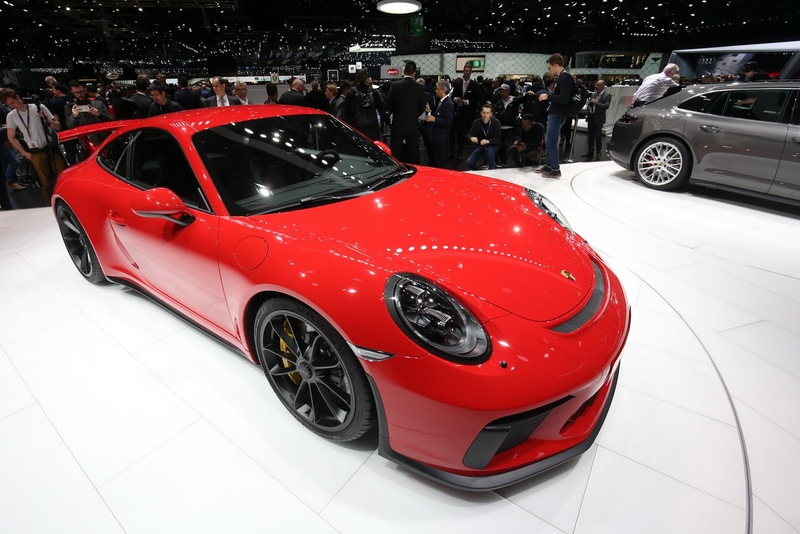 The 911 R will be remembered as a parts bin special that, for 1 year, had a special place in our hearts but was quickly replaced and improved upon when the 991.2’s were released. 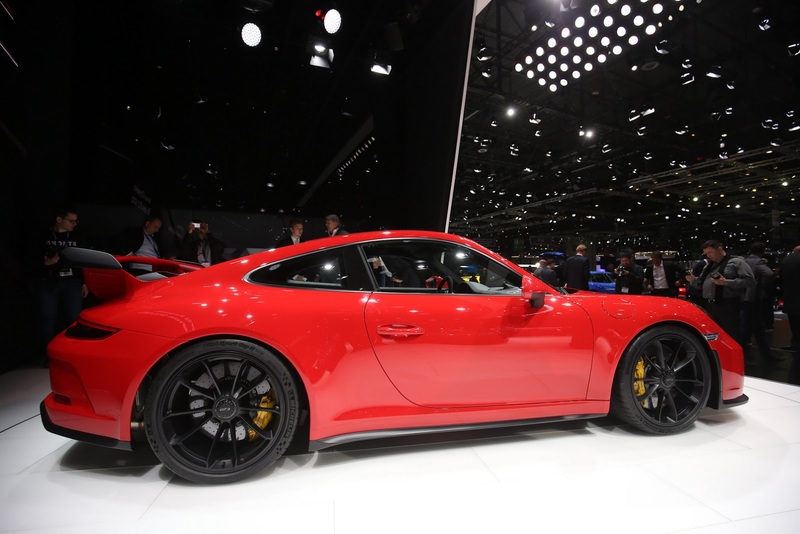 Didn’t you see used 911Rs on sale for almost 1 Million? 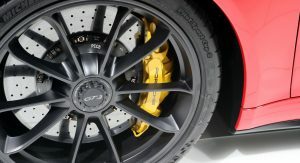 I saw, and Porsche CEO also saw them, and he didn’t like it. 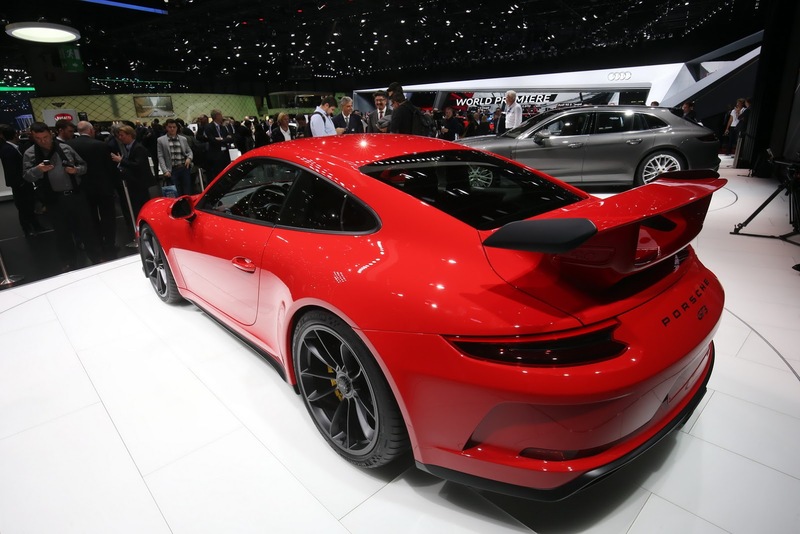 Many people believed that the 911R would be the last powerfull, non-turbo, manual gearbox 911. It’s not, and that’s a good thing for petrolheads. 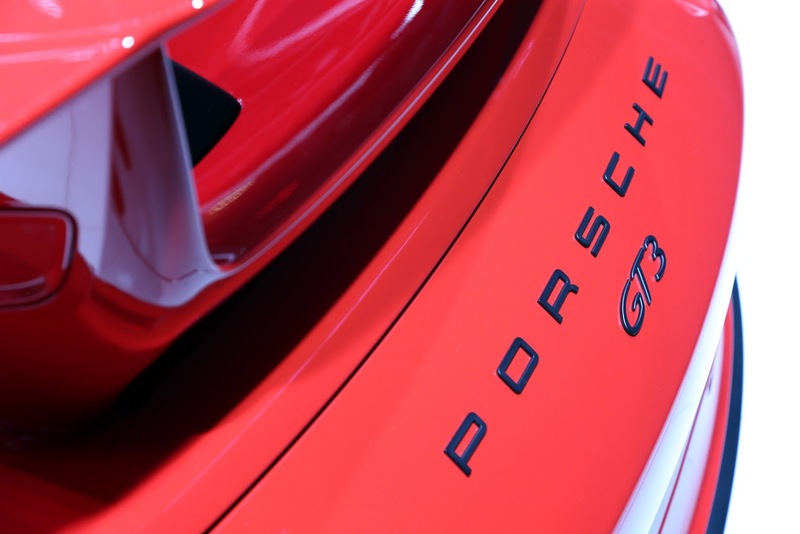 Porsche doesn’t want speculators to buy their new cars, and I really appreciate that. 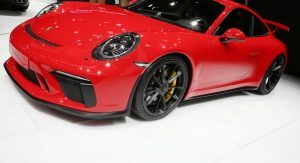 Comparing this Porsche with Mercedes-Benz new GT-R, it makes me question Mercedes pricing. 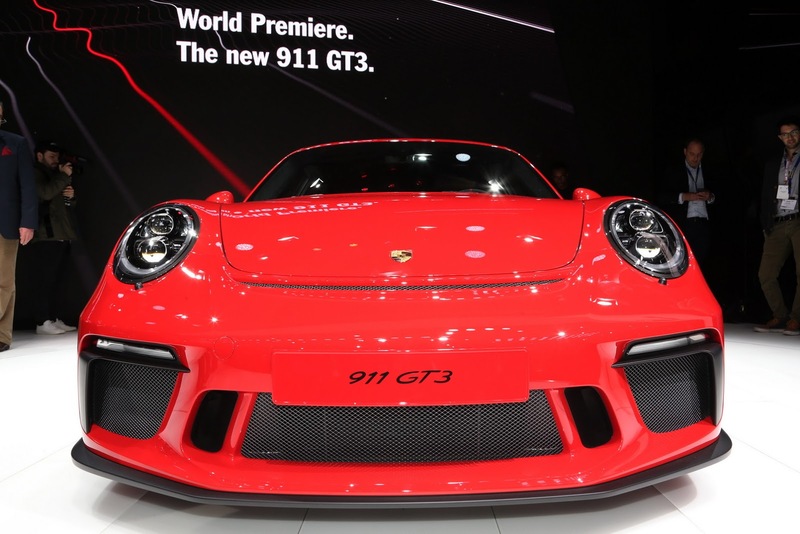 The 911 GT3 is priced at $147K with V6, 500HP and 0-60 timing in just 3.2s (PDK). While Mercedes GT-R is priced at over $200K, and equipped with V8, 585HP, 0-6 timing in 3.6s. 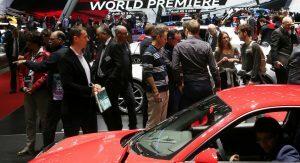 The quality of both brands are unquestionable, but Mercedes recently is beginning to reach Bentley and Rolls Royce territory in terms of prices, with performance almost the same or even less than its competitors. very good point of you have. also check g63 v8 and g65 v12 prices. both almost have SAME specs except modern v8 got replaced by outdated v12 in favor of g65, they are asking 70k dollars for it! 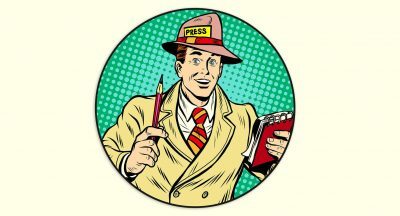 DAMN I wish I had a better job!!! 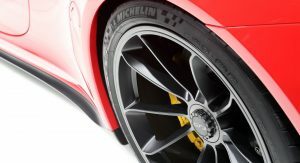 You guys think this will shoot up instantly in price like the 911R did?